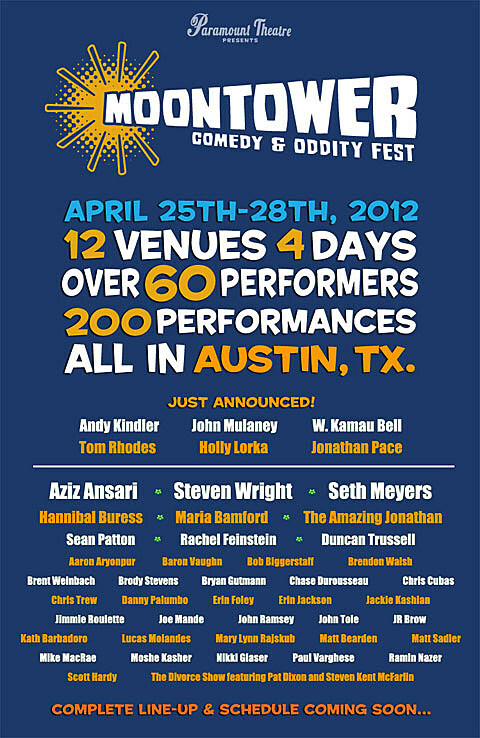 Though there’s enough comedy at SXSW this year to keep us satisfied for a little while, in just about two months, the first Moontower Comedy & Oddity Fest will be held in Austin. The festival, scheduled for April 25- 28, is “four nights of stand-up, improv, sketch, and musical comedy throughout the city” includes performances by Aziz Ansari, Steven Wright, Seth Myers, Hannibal Buress and many more (all listed below). Moontower Comedy and Oddity Festival presented by the Paramount Theatre brings to Austin, TX some of the funniest, wittiest and oddest world-class comics from around the globe. This marathon of side-splitting nights throughout the city is slated to bring over 60 comedians doing everything from stand-up and sketch to improv and musical comedy. National headliners, up-and-comer and local Austin-based comedians ensure that there are options for every type of comedy fan; die-hards to those just looking for a fun night. Four-day passes to the festival, as well as VIP passes are on sale now. Single performance tickets will be available for purchase TODAY (2/23). For instance, Aziz Ansari tickets (early and late) are on sale at 10am. Aziz also plays Bonnaroo in June.